When Brad Pitt signs up to kill nazis in a WWII movie, you say, “YES”. This particular movie is called ‘Fury‘, and is a solid, very good war film. It’s brutal, violent, raw, and has enough of a fresh feel to keep you on the edge of your seat throughout the entire 134-minute runtime. 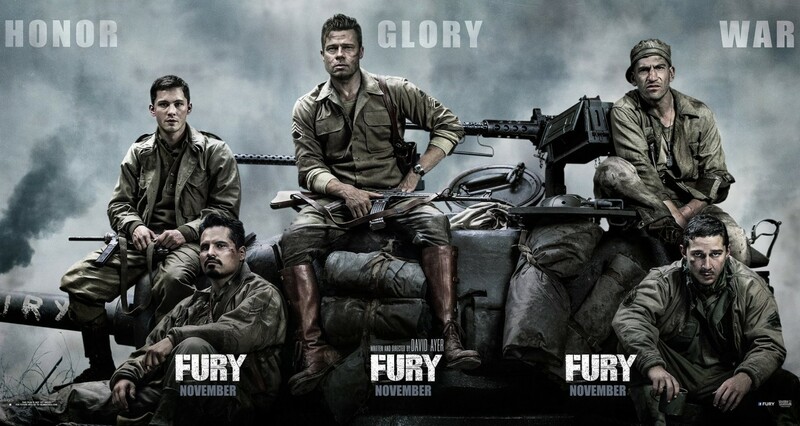 Instead of being out in the open, walking the fields of France or another nazi occupied country, ‘Fury‘ takes place mostly inside a small steel tank with five guys led by ‘Wardaddy’ (Pitt), during the final month of WWII. The claustrophobia sets in quickly and gives us an ample amount of time to dig deep into each soldier inside the tank. Writer-director David Ayer is known for his cop drama films, (‘End of Watch‘, ‘Sabotage‘, ‘Street Kings‘, and ‘Training Day‘) to name a few. And he pulls from his past work to take on the fierceness of this merciless story of a squad of U.S. tanks, winning the war against the Germans. It’s a story you won’t soon forget, yet in the final moments of the film, Ayer pulls a stunt that almost ruins everything that came before it. Despite that horrible aspect, ‘Fury‘ is quite good. Wardaddy is a tank commander with the 2nd Armored Division who has been around for quite a few wars. He’s a seasoned soldier, rough, tough, and has seen it all. However, there is something deeper inside him going on that shows us there’s more to him than just being a nazi killing machine like we saw in Quentin Tarantino’s ‘Inglorious Basterds‘. 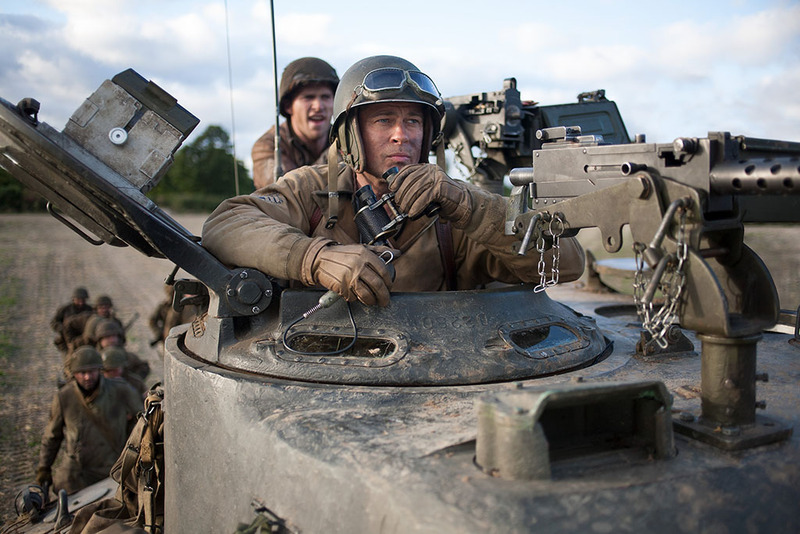 But his sheer barbaric ways show when he initiates a newcomer named Norman (Logan Lerman), a young kid who is a trained typist for the army, who is literally thrown into Wardaddy’s tank as an assistant driver, even though Norman has never seen the inside of a tank. Wardaddy forces Norman to shoot a captured S.S. Officer point blank in the head, and that will be the first of many things Norman is forced to do over the course of this movie. 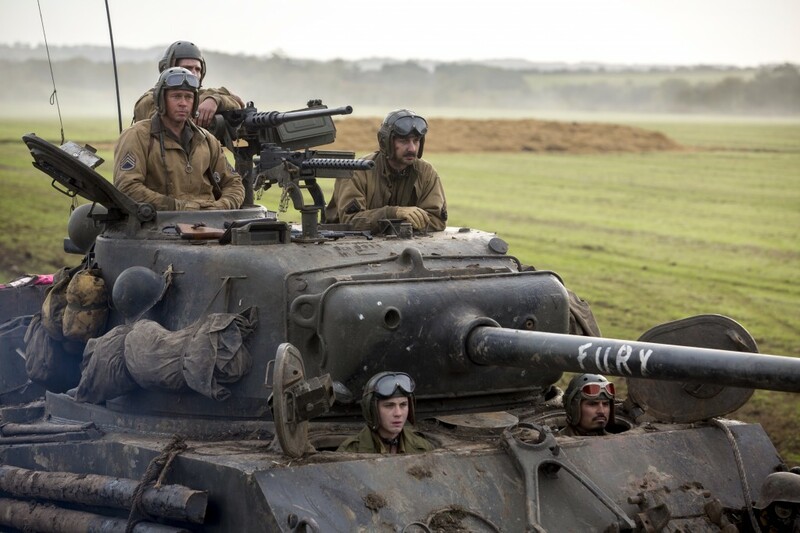 The other soldiers inside ‘Fury’, which is painted on the tank’s gun barrel are Boyd (Shia LaBeouf), a rough solider who is also super religious, Trini (Michael Pena), the driver with a drinking problem, and Grady (Jon Bernthal), the aggressive red neck jerk of the highest level. These seem like stereotypes, but I can assure you, Ayer has written them with a good amount of depth, particularly LaBeouf’s character who hasn’t been this good in anything for many years. As the war is coming to a quick end and as the nazis are still fighting to their last breath, the Americans are taking town by town, usually led by Wardaddy’s tank unit. After the successful take over of a nazi occupied town, there is a moment for some down time where Wardaddy takes Norman under his wing and up to an apartment where a mother (Anamaria Marinca) and her teenage daughter (Alicia von Rittberg) come face to face with the two U.S. soldiers. They are terrified at first, but Wardaddy puts them at ease, and the women end up making a meal and drinks for the two soldiers. This might be the best scene in the film as we get a small glimpse at someone who has been through hell and seen such horrible atrocities, still trying to have a normal life of routine and genuine pleasantries. But war is terrible, and this nice situation doesn’t last long as the rest of Wardaddy’s crew heads up to the apartment and ruins this seemingly nice setting. It’s not their fault really, but it’s rather what the war and the stuff they had to do to survive and win has done to them, turning them into animals. The climactic scene doesn’t seem to make any sense as the Captain of the unit tells Wardaddy and a few other tanks go on a big mission to stop a treasure trove of nazis that are headed to a certain location. Even though the war is quickly coming to an end, and this mission doesn’t seem to have much of a reason, it’s unclear why the captain would send these great soldiers on what seems like a suicide mission. And this we are in the steel tank again as our soldiers fight a never-ending stream of nazi soldiers. But again, Ayer pulls this wild card out of his back pocket, that completely negates anything that came before it, and almost destroys his own film. Pitt is great in his role and gives a few layers of depth to his brute soldier character. Lerman (‘The Perks of Being a Wallflower’) plays the newbie who is forced to hold a gun and kill any german soldier he faces very nicely. And the rest of the crew turn in amazing performances as well. The set pieces, uniforms, and tanks all add to the realistic setting of 1945 Germany. And Ayer’s direction keeps you on edge, particularly during one of the tank battle sequences. ‘Fury‘ is an ultra-violent and bloody war film and is a solid entry into the WWII genre, however it almost imploded on itself at the end, leaving a bitter taste. Bryan’s Review of ‘End of Watch’!!! This entry was posted on Thursday, October 16th, 2014 at 10:15 am	and is filed under Film, News. You can follow any responses to this entry through the RSS 2.0 feed. You can skip to the end and leave a response. Pinging is currently not allowed. « ‘HBO’ Launching Netflix-Style Streaming Service Next Year!! !